The ViewSonic PS501W price-performance short throw projector features 3,500 lumens, native WXGA 1280x800 resolution, a user-friendly design, and a sleek white chassis. Exclusive SuperColor technology offers a wide color gamut for beautiful image production in nearly any environment. A short throw lens with a 0.49 throw ratio offers large projection images for smaller rooms. The PS501W also features HDMI and VGA connectivity, and a RS232 control port. An energy-saving DynamicEco feature reduces power consumption by up to 70%, and extends the lamp life up to 15,000 hours. With advanced audiovisual features and flexible connectivity options, the PS501W is ideal for use in education and small business environments. 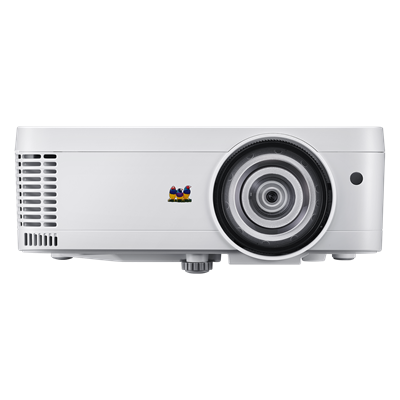 The ViewSonic® PS501W price-performance short throw projector features 3,500 lumens, native WXGA 1280x800 resolution, a user-friendly design, and a sleek white chassis. Exclusive SuperColor™ technology offers a wide color gamut for beautiful image production in nearly any environment. A short throw lens with a 0.49 throw ratio offers large projection images for smaller rooms. The PS501W also features HDMI and VGA connectivity, and a RS232 control port. An energy-saving DynamicEco® feature reduces power consumption by up to 70%, and extends the lamp life up to 15,000 hours. With advanced audiovisual features, flexible connectivity options, and an affordable price, the PS501W is ideal for use in education and small business environments. **Up to $150 added value over competitive models with 1-year warranty and based on extended warranties from manufacturers and not third party warranty providers.